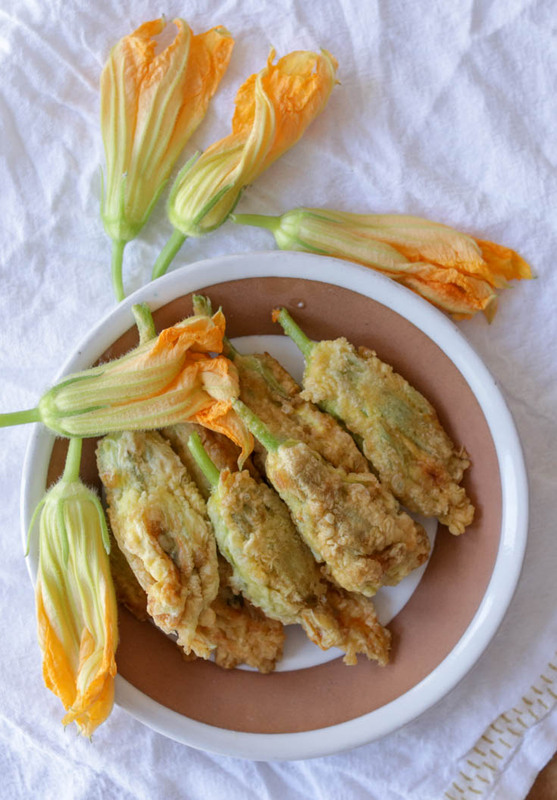 When you see squash blossoms show up at your spring and early summer farmers’ markets (pretty much the ONLY place you’ll see them unless you have a garden yourself) grab a bunch and make stuffed squash blossoms as soon as you are able! Often, I just use a soft cheese but we had a few cooked shrimp leftover and a batch of basil pesto in the fridge, so I combined it all to make shrimp and pesto stuffed squash blossoms. But the method is the same, whatever filling you want to use. Other fillings I’ve used are cream cheese mixed with green onions and garlic; cream cheese and shredded Parmesan together; or chevre with fresh herbs. Some people like these served with a thin tomato sauce for dipping, but for me, they are fancy enough and tasty enough not to mess with that extra step. Stuffed squash blossoms are an excellent appetizer served with a glass of wine. Leftovers may be chopped up and folded into an omelet for breakfast. 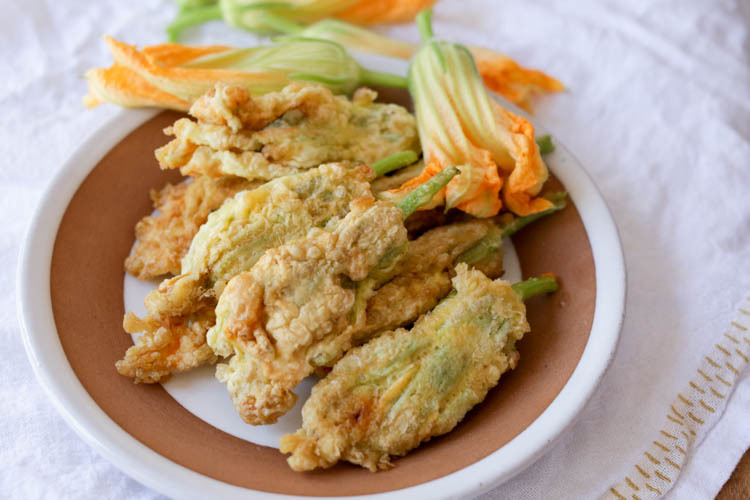 Scroll down below recipe to see a short video tutorial of stuffing and frying squash blossoms! Shake the flowers out, gently, one by one, to rid them of dust and tiny bugs. Don’t rinse them unless you absolutely need to. Mix the cheese, chopped shrimp and pesto together with a fork, breaking up the cheese. Carefully open the petals of each blossom and use a small spoon to put about 2 teaspoons of the cheese down into the bottom of the flower. Twist the petals closed. Set aside until all are filled. In a small bowl, whisk the eggs and water. Put the flour in another bowl. Heat the olive oil in a skillet over medium-high heat until shimmery. Dip the blossoms in the egg, let excess drip off. Roll them into the flour and shake off excess. You don’t have to be very precise — this should be a quick process. Fry in oil, turning once or twice, until golden brown all over. Drain on paper and serve hot or warm. What else might work instead of shrimp, which would kill me? Don’t die! Truly, I have always, previously, just done these with cheese; this was the first time I added shrimp. So you can use soft goat cheese, cream cheese and/or either of those mixed with herbs, green onions or pesto. They are delicious no matter the filling.